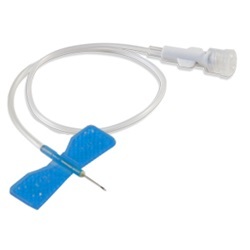 Sterile Kawasumi Small Vein infusion set with 25 gauge, 0.75" needle with 0.34ml priming volume and no safety feature. 12" tubing with dark blue wings and female luer lock. 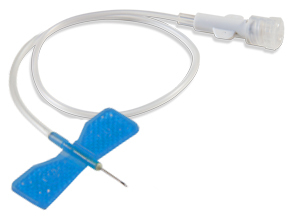 Flexible wings with textured surface for secure grip which are color coded for easy identification and siliconized needle for easy insertion. Tubing is kink resistant and latex free. Comes in a box of 50. Manufactured by Kawasumi.